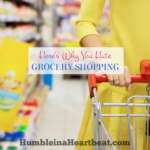 Tired of overspending on groceries? You don’t have to break the bank to feed your family healthy food. 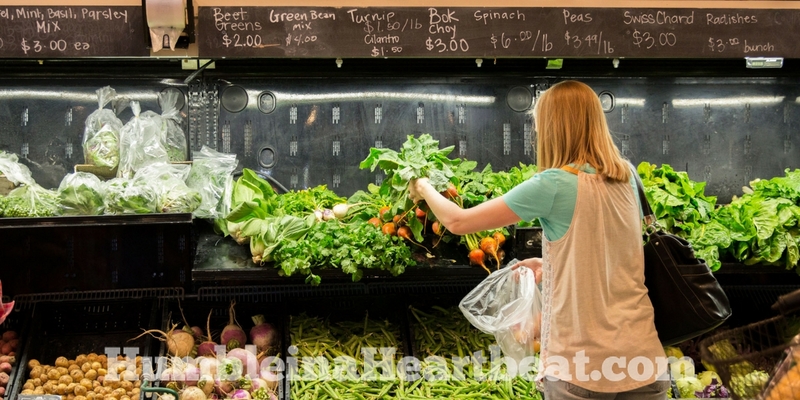 Check out these top tips for affordable healthy eating! It’s the last day of the month. You have no money left for food, but you have to eat, right? The last two months this happened you used your credit card to pay for all the groceries in your cart, but now your credit card is nearly maxed out. You suddenly remember you have $15 in your purse because you sold some of your kids’ clothes over the weekend. That $15 could buy you a few things until you are paid on the 5th. But what could you buy with $15 for a family of 5 that is truly healthy? This, dear friend, could very well be your situation. Money is in short supply and you want to give your family clean, quality food. So what’s a mama to do? Should you wait until you have a bigger paycheck to start feeding your family balanced meals each day? Unfortunately, most moms and families who have small grocery budgets feel like that’s their only choice. That healthy food is out of their reach and reserved for those with a lot of ka-ching in their bank accounts. I am here to tell you to STOP. Stop believing that outrageous lie. That in order to eat well, you must be bringing home at least $75K a year. And that if you live in a large metropolis, you may as well forget about eating healthy food until you strike it rich! You have a choice, friend. You could believe that you have a limited budget. Or, you can believe that your budget, no matter how small, can actually buy you food. And not just any food, but really healthy, whole foods. I hope you want to believe that no matter how bad your situation may seem, you do have money to buy good food. Please start believing that, because it’s important. In fact, I think it’s more important than any other tip I could give you below. 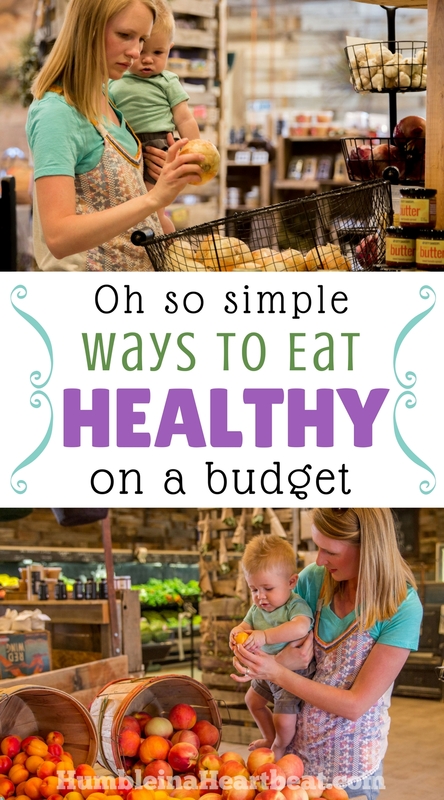 So now that you’ve made the choice to love the grocery budget you have and treat it with care, let’s talk about the ways you can eat very well on a limited budget. 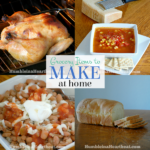 Tips abound on this vast world wide web about what you can do to stretch a small grocery budget. I’ve read through so many tips my head is spinning. Not only have I read through ALL the tips, but I’ve practiced many of them over the years. Instead of giving you a long list of tips to make your eyes glaze over, though, I want to share the top tips that can make the biggest impact on your small grocery budget. Please don’t read through this list and return to your normal, everyday life. Put these tips into action TODAY. It’s a waste of my time and yours if no one is using these tips to really save money on their food. Promise me you’ll try at least three of these tips in the next week. 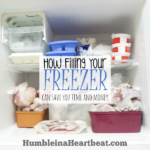 Before you ever think about penning in your meals on your cute meal planning printable, writing a shopping list for all those new recipes you’re going to try, going to the store for all the ingredients (many of which you’ve never heard of), and cooking all those amazing meals, you need to think about what you already have in your fridge, freezer, or pantry. I’m betting you can probably make at least one meal, if not five, BEFORE you set foot into a grocery store. Boring much? Why, yes. If you’re struggling to put food on the table at the end of every month, though, you have to get your head out of the clouds. Spend 20 minutes scanning all the food in your house. You can quickly write down meal ideas as you do this. But, if you’re like a lot of people, you have no idea what you could make with all this random foodstuff. Pull up a website like Allrecipes or Supercook and search recipes by ingredients. Avoid recipes with lots of ingredients because you’re just trying to use up the food you already have. Take action: Do a cooking competition as a family to see who can come up with the healthiest and tastiest meal. List as many meals as you possibly can, then write down exactly what you’ll be eating on your meal plan. Let me challenge you even further: make sure the meals are healthy. Maybe you’ll come up with a good week’s worth of meals and only need to go to the store for some fresh or perishable ingredients. We’ve been doing our meal plan like that for a while now. I only plan two weeks of (new) meals each month. The other two weeks are based off what we already have in our house with a quick run to the store for any produce or dairy we might need. When we started doing this over a year ago, I realized we were saving at least $100 a month. You’re gonna roll your eyes for this next one, because you’ve heard it a million and one times, and it always goes in one ear and out the other. But, I’ll mention it anyway. Stop eating out. Cook the majority of your meals at home. Okay, okay. I guess I really have no place to tell you to “Stop eating out.” If you do want to eat out, at least plan it into your budget and meal plan. Make sure you are choosing to eat at places you can afford and that you know you’ll have money to spend on groceries later in the month. Eat only where there are healthy options so you can still feed your family healthy food. Quick question: How many times a week do you eat out with your family? It’s so simple, but when most people say their grocery budget is tight they don’t realize that their eating out “budget” is actually pretty large in comparison. I think it’s because they want to believe that they eat out less than they do so they don’t really track how much they are spending. I hate to tell you this, but if you are eating out just two times a week with your family of 4, you’re probably spending an average of $300 a month. Yikes! If your grocery budget is right around that amount and you’re eating out, you’ve gotta set your priorities straight. It is a luxury to have the convenience of restaurants and fast food. But from a healthy-living and budget stand-point, eating out doesn’t make a lot of sense. Cooking your own food gives you the control to make it as healthy as you like. It’s also a whole lot cheaper than paying someone else to cook it for you and clean up the mess. Alright, here comes another piece of advice you’ve heard so many times you know it by heart: Always start with a plan. If you’re trying to save money, you cannot wait until an hour before dinner to start thinking about what you’re going to eat for dinner. Do we all do it? Yes. Is it the most blissful of moments you’ve had in life? I’m betting no. Take action: Set a reminder on your calendar to meal plan at the same time and day each week. Basically, don’t let your life dictate how you eat. You need to be in control of how you’re going to eat. It’s the only way you’ll stay on budget and be able to feed your family well. It really doesn’t matter how you meal plan. I’ve tried so many meal plans and they all pretty much work the same. The only thing you should care about is that you have a meal plan that you can follow quite closely. Life will inevitably throw you a curve ball every so often and trip you up. But you need to at least have a basic idea of what you could make with the food you bought at the store. Otherwise, you are wasting your time and money. Okay. Now. Before you go all gung-ho with your meal plan, just step back for a minute, honey. Don’t open any cookbooks. Don’t start browsing Pinterest. Don’t even open up your tried-and-true recipes binder. You will save the most money if you keep your meals uber simple. Take action: List out as many simple meals you possibly can in 10 minutes and keep the list on your fridge. I’m talking veggies, protein, and grains. You can always marinate your meat or make a nice vinaigrette for your salad, but try not to go overboard with ingredients, especially fancy, exotic ones. When you’re on a tight budget and you want to eat healthily, it’s important to use the least amount of ingredients possible. Simple definitely does not have to be boring. I’ve actually been pleasantly surprised at just how tasty many of our meals turn out when I keep them on the simple side. Adding just a bit of lemon zest or garlic can elevate almost any meal. How often do you go to the store, shopping list in hand (or not), and immediately start throwing things in your cart that you don’t need but look super delish? It’s okay, you can admit it. We all do it. I do it far more than I’d like to admit. But if you can make it a habit to stick to your list or just the things that are important to your health, you will spend far less. Take some time to consider what is important to you when it comes to your food. In other words, prioritize where your grocery budget money needs to go. For me, I try to spend about 25% on protein, 20% on grains, 50% on produce, and 5% on miscellaneous items. It doesn’t always work out that way, but it usually comes pretty close. Quick question: If you aren’t willing to give up all the junk, what can you give up right now? When you know where your money needs to go, you’ll find that those chips aren’t as appealing anymore. 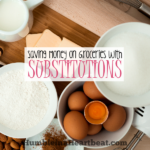 Which means that your tight grocery budget will be a bit looser since you’re no longer buying unnecessary items. And then you’ll be able to afford the healthy food that you once thought you could not. Your husband just might kill me, but I have to say it: stop buying (and eating) so much meat! Our bodies need less meat than you might think, and you can live off eating other sources of protein as well as smaller portion sizes of meat when you do eat it. I get so many emails from people saying that meat is killing their grocery budget. There are actually a lot of ways you can save on meat (I’ll save that for another post), but what I would do is take meat out of the spotlight and give it a supporting role on your plate. Make sure the vegetables and fruit are the stars and keep the meat to about 25% of your plate. Quick question: Can you think of 5 meals you make where meat is not the star? I would also take it a step further and incorporate vegetarian and vegan meals into your meal plan at least once a week. Even better if you can do it three times a week. The less you are eating meat, the more money it frees up in your tight grocery budget to buy the things that are healthier for you. 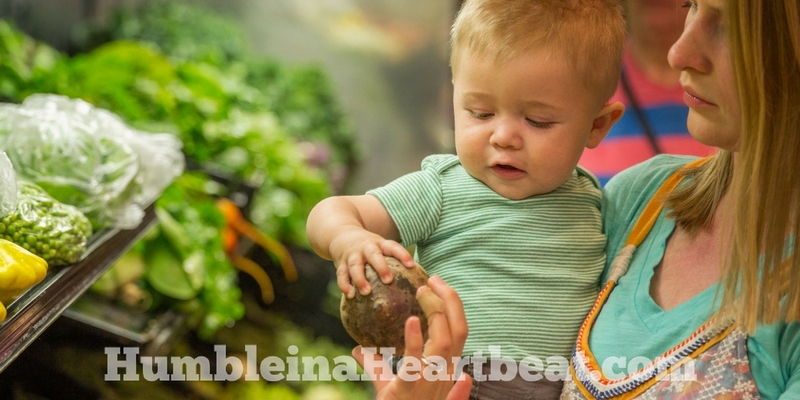 Let’s pretend that you are just starting to buy a lot more produce because you want your family to be all healthy. But what about all the other times you bought a ton of produce and it all went to waste? Now is the time to come to terms with what your expectations are for healthy eating and what reality is. Know thyself. Nobody is perfect, and you probably won’t adopt all the healthy eating habits for a while, maybe even for several years. If you find yourself buying a big bag of lettuce every week, but you only get through half of it before it wilts and becomes all slimy, buy a smaller bag. Quick question: What 3 foods could you stop buying because they always go bad? Yes, it’s important to buy the healthy stuff so you aren’t tempting yourself with the not-so-great stuff. But don’t buy more of the healthy stuff just because the ideal is to eat it all. The point is to make eating healthy a habit, it’s not to be perfect right away. Be aware of the food you waste each week and stop buying it (or buy less of it) until you are ready to commit to eating it. For those of you who have been patiently (or impatiently) waiting to hear me talk about shopping the sales, now’s the time. However, I’m not going to tell you to buy anything and everything that is on sale. Just the things your family eats all the time and the foods that are healthy. 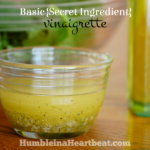 Ever heard of pantry staples? If you’ve been around my blog for long, you might have read my post on starting a pantry staples list. Your pantry staples are the ingredients your family uses often. You should always have them on hand, too, so you can make several meals with them. Take action: Quickly list out 10-20 items that you always keep on hand or seem to always buy when you go grocery shopping. Because you know you need these pantry staples in your house, wait to buy them until they are on sale and then buy a lot of them at once. If what you need is something perishable, you’ll have to learn how to preserve it so you can use it in a couple of months. Of course, if you see something healthy on sale that’s not on your pantry staples list, and you want to incorporate it into your meals this week, by all means buy it. Don’t buy too much of it, though, unless you plan to continue using it in your meals. Only shop at 1-2 stores each week. It costs money to drive around from store to store, and it also takes a lot of time. If you have even one kid, this tip will save your sanity, I’m telling ya! Choose to shop at the store(s) that can give you the greatest bang for your buck. This store should offer high-quality and inexpensive meat and produce. Quick question: What store(s) in your area can you spend the least amount of money and still get great food? Finally, one of the biggest ways you can save money on your food is just by storing it properly. If you tend to throw away half the produce you buy each week, learn how to store it properly. Or at least eat it earlier in the week. Quick question: What are 3 perishable items that you always seem to be throwing out? Watch YouTube videos that can teach you how to store them properly! I used to buy lettuce and prepare it myself. When we had kids, I started buying salad in the bag or the big plastic container. For a while, I was throwing away a lot of the lettuce in the big plastic container because it would go bad before we could eat it all. So I turned to the internet to find out how to store lettuce so it stays fresh for longer. What I found is that by storing the salad with paper towels to soak up the moisture it lasted several days longer than it did in the past and we were able to eat it all. Follow my pinterest board, How to Store Produce, to learn the best ways to store your produce so you can stop throwing it out. Whew, and that’s a wrap! Now, maybe you already do all 10 of these things and still struggle to stay within your grocery budget. While I don’t believe healthy eating is as expensive as most people think it is, it also isn’t exactly cheap. You do have to spend money, and $100 or $200 a month for groceries for a family of more than 3 or 4 people might be pushing it. You also can’t expect to spend just $200 a month if you are living in a large city. Be realistic. If you think your grocery budget might be too low, check out my post, 6 Steps to Determine Your Family’s Unique Grocery Budget. 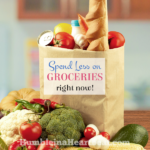 I’m curious, do you already use these tips to keep your grocery budget low? Are there any tips you think are important that I didn’t list? 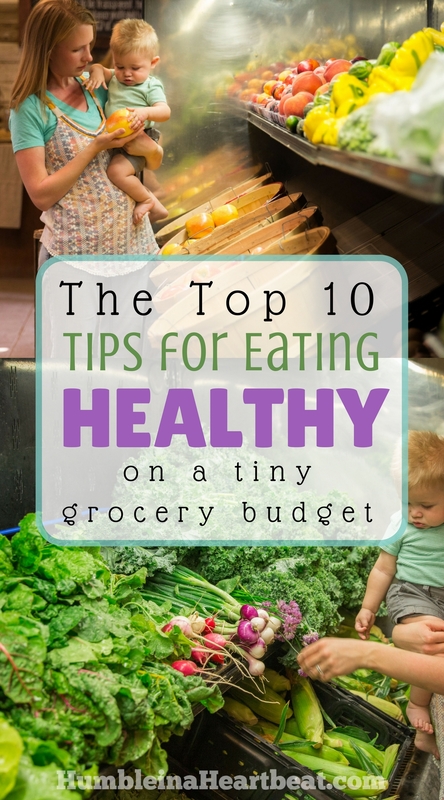 Feel free to leave a comment so we can all learn more ways to stretch those food budgets! 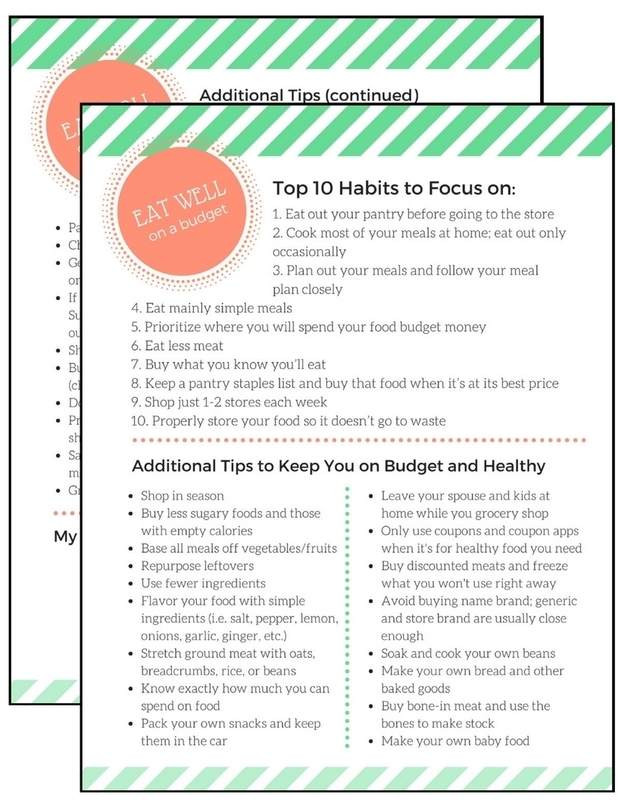 Sign up now to get this checklist for eating well on a small budget. You can eat healthy meals even when you are strapped for cash! I'd love this, send it my way! Couldn’t agree more regarding meal plans to keep the budget tight. Nothing like getting half way through the week eating like a king only to find your self scraping by the rest of the week. The ten to 20 essential things in your cupboard tip is much more relevant too when thinking about a weekly meal plan so you can budget for that as well. Thanks for the tips – really informative! Looking forward to reading more from you like it! Thanks for stopping by, Hunter! Hi Charlee, thanks for these tips. We follow maybe 40% of the tips you shared in the article. We tend to eat what’s already in our home before grocery time. We cook and eat meals at home most of the time, but we still love meat and we find it a little difficult to come up with a meal plan. We’ll work on the other tips. Good luck to you, Mighty! Will be working on thee tips…one tip that we’ve always heard but is so relevant…don’t go to the store hungry! Our systems are dependant on the food we consume so eating well should be a top priority for us. Foods rich in vitamins and minerals are critical for proper functioning and without these, your body and mind will start to deteriorate much faster. Knowing what to consume is based on so many individual factors and I can help figure those factors out. I am a nutritional therapist in Cape Town, love your thoughts. Great tips ! some of the idea i followed but now i will add some new. Thank for sharing.